Hot Air Ballooning History-Facts-& Stories. Joe Kittinger will forever be one of the largest contributors to the aviation history. Joe Kittinger -Balloon history-USAF-balloon facts Part 1. Known to his colleagues as “Red”. Armed with a smile from ear to ear and the brightest red hair, You knew when this man walked into the room. Born in July 27th 1928 in Tampa Florida, obtained his education from the Bolles School located in Jacksonville Florida. It was there he became enthralled with planes in specific and aviation in general as most children dream about at that age. At the age of 17 years old, he took his first solo flight in a piper cub airplane. He signed with the U.S. Air Force as a cadet of aviation in March of 1949, walking away from his passion of speedboat racing for his new found desire. Signing with the military would get him on a fast track pace to obtain his wings during a time when the country just battled through some of the toughest times. In March of 1950 Red graduated and was awarded his shiny new set of wings, it was at that time he was promoted to second lieutenant and he was assigned to the 86th fighter bomber wing that was based in West Germany. During this time, Red would go on to fly the F-84 Thunder-jet and the F-86 Sabre. Year 1954, Red received orders to AFMDC at the Holloman AFB located in New mexico State. It was at this time in Red’s life, he got to fly the observation/chase plane that monitored flight surgeon Col. John Stapp’s rocket sled of 632 MPH in the year 1955. Kittinger was impressed with Stapp’s leadership & devotion to aerospace medicine. Stapp was in awe of Red’s skillful jet navigation, Stapp recommended Joe Kittinger for space-related aviation research work. It would be John Stapp assigned to lead research in high altitude balloon testing that would solidify each others friendship for the rest of their time on earth. The project was called Project Manhigh. It would be this project manhigh 1, Joe Kittinger would set the interim balloon altitude record of 96,760 feet. 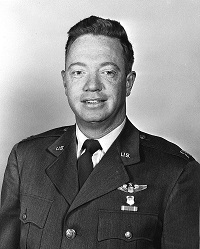 It was at this time Joe Kittinger was awarded his first of six military “Distinguished Flying Cross” medals (“heroism or extraordinary achievement while participating in an aerial flight). Thats right…. one of six!